A PARTIR DEL LUNES 4 DE FEBRERO 2019 Y CONTINUANDO HASTA EL MARTES 30 DE ABRIL 2019, RADIO ESCUCHAS DE LA RANCHERA 104.7 FM & 890 AM, MAYORES DE 18 AÑOS TENDRAN LA OPORTUNIDAD DE GANAR UN PAQUETE THE ULTIMATE PARTY EXPERIENCE PARA 10 PERSONAS EN COUNTRY CLUB LANES & LAZER X.
REGISTRATE Y CALIFICA: RADIO ESCUCHAS DE LA RANCHERA 104.7 FM & 890 AM, VISITEN LARANCHERA890.COM Y REGISTREN SU INFROMACION BAJO LA PESTAÑA CLUB VIP. RADIO ESCUCHAS DE LA RANCHERA 104.7 FM & 890 AM TAMBIEN PODRAN MANDAR UN POSTAL CON SU NOMBRE COMPLETO, DIRECCION, NUMERO DE TELEFONO, Y NOMBRE DEL CONCURSO O PUEDEN REGISTRARSE EN PERSONA EN LA ESTACION LOCALIZADO EN EL 1442 ETHAN WAY, SUITE 101, SACRAMENTO, CA 95825 ANTES DE LAS 5:00 PM EL DIA LUNES 29 DE ABRIL 2019. 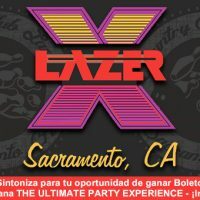 CONCURSO: UN GANADOR DE ENTRE TODAS LAS INSCRIPCIONES REGISTRADAS SE SORTEARÁ EL MARTES 30 DE ABRIL 2019 Y GANARÁN THE ULTIMATE PARTY EXPERIENCE PARA 10 PERSONAS EN COUNTRY CLUB LANES & LAZER X. EL VALOR ESTIMADO DEL PREMIO ES $350.00 PROPORCIONADOS POR COUNTRY CLUB LANES & LAZER X CON FINES PROMOCIONALES. EL GANADOR SERÁ NOTIFICADO POR TELÉFONO Y/O CORREO ELECTRÓNICO. BEGINNING MONDAY FEBRUARY 4, 2019 AND CONTINUING THROUGH TUESDAY, APRIL 30, 2019, LA RANCHERA 104.7 FM & 890 AM LISTENERS, 18 OR OLDER WILL HAVE THE OPPORTUNITY TO WIN ONE ULTIMATE PARTY EXPERIENCE FOR 10 PEOPLE AT COUNTRY CLUB LANES & LAZER X. REGISTER & QUALITY: LA RANCHERA 104.7 FM & 890 AM LISTENERS VISIT LARANCHERA890.COM AND REGISTER YOUR INFORMATION UNDER THE CLUB VIP TAB. LA RANCHERA 104.7 FM & 890 AM LISTENERS MAY ALSO MAIL IN A POST CARD WITH THEIR NAME, ADDRESS, PHONE NUMBER, AND NAME OF CONTEST OR SIGN UP IN PERSON AT THE STATION, LOCATED AT 1442 ETHAN WAY, SUITE 101, SACRAMENTO, CA 95825 BY MONDAY, APRIL 29, 2018 BEFORE 5:00 PM.